(I) Set up a new directory and add the DS1D.EXE and DS11.EXE files. (ii) Download the sample data file DS1VD.DAT file to this directory. (Iii) Optionally study the data by running DS1D.EXE and pressing the button to read in the existing DS1VD.DAT file. (iv) Run the DS11.EXE file and select the “new run” (#3) option in the resulting command prompt window. (v) Stop this run at about TIME 2.e-5 sec and restart with the “new sample” (#2) option, followed by the “adapt the cells” (#1) selection. (vi) Conclude the run around a flow time of 3.e-5 sec or greater. 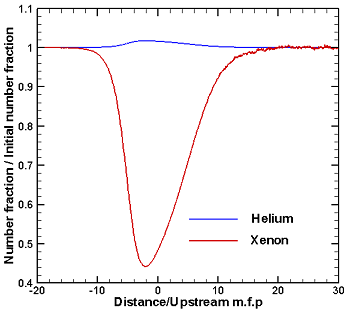 The structure of a Mach 5 shock wave in an equal parts by mass mixture of helium and xenon. The computation time for this demonstration case is only a few hours on a contemporary PC. The output files are text files. The main file is DS1OUT.DAT which contains an extensive table of results for the properties of the gas mixture and also separate tables for the properties of each molecular species. This permits a manual study of the flow, but will generally have to be edited for use in whatever post-processing program is used to plot the results. For a steady flow such as that in this example, there is also a restricted set of data in PROFILE.DAT. This was read directly into the TECPLOT (Version 9) program in order to produce the figures that are shown above. 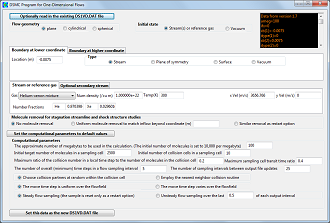 All DSMC calculations are unsteady and the preceding references to steady flow mean that “Steady flow sampling” was specified in the DS1D menus. When “Unsteady flow sampling” is specified the output files are DS1nnnn.DAT, where nnnn is the four digit integer for the output interval. The boundary conditions that produce the above results for the shock wave structure require knowledge of the downstream flow through the Rankine-Hugoniot jump conditions in order to specify the “secondary stream”. This works only because the program variables are all 64-bit. With 32-bit variables, the shock location would be subject to an unacceptable random walk. However, the use of the jump conditions is philosophically undesirable in all cases and, for reacting gas flows, the downstream flow conditions are unknown. The alternative is to specify only the upstream conditions as the “stream or reference gas”, set the “Boundary at higher coordinate” to “Plane of symmetry”and, under the “Molecule removal...” heading, choose “Similar removal as restart option”. Starting the program will then produce an unsteady shock wave moving back into the gas. 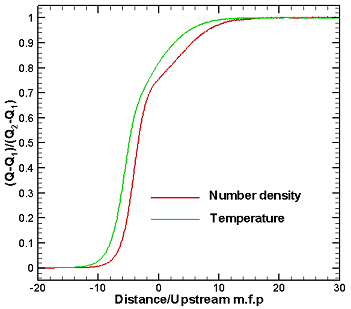 When the number of simulated molecules have built up to a sufficient extent, stop the program and specify complete removal of the entering molecules over a small region upstream of the downstream boundary. The location of the downstream boundary should have been extended to more than accommodate this region. A steady shock wave will then be established, although there will be considerable unsteadiness and the total number of molecules mat have to be adjusted through further restarts. Commence sampling when the flow is steady. Note that the data on the gas species and reactions is set within the source code, rather than in the data file.